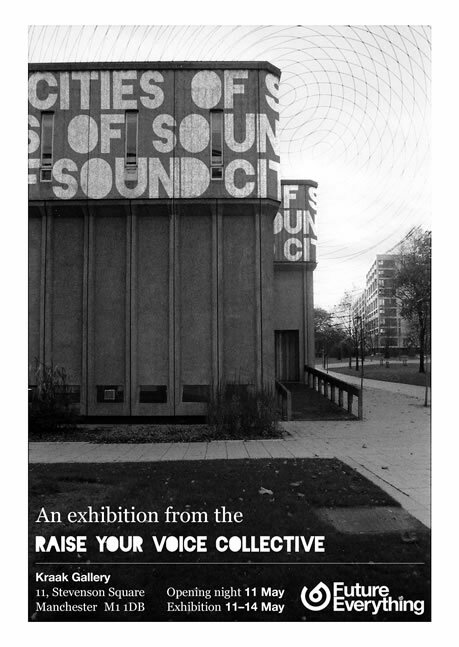 Latest news about the activities of the Raise Your Voice Collective. We’re pleased to announce a new concert. On Friday 7 October at the International Anthony Burgess Foundation, Raise Your Voice Collective present an evening of music from Trio Atem, the Raise Your Voice Ensemble and Efpi Records’ 265 Quartet, a fascinating world where experimental and contemporary classical music mingle with jazz. More details soon! You can also find a few photos and a video of Pond Life on Fat Roland’s blog. We are excited to announce that Raise Your Voice will be taking part in this year’s FutureEverything Festival in more than one way. 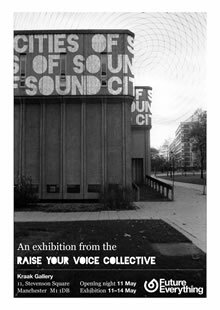 Following our appearance at last year’s festival, this year sees an innovative project that combines an exhibition of sound installations with live performance under the title Cities of Sound. From 11-14 May, Kraak Gallery will host internationally recognised works by Manchester-based artists — including Sam Salem and Patrick Sanan’s Pond Life III — exploring ideas of the city, living and lived-in systems, the facts of urban life, and the sounds these produce. An opening night on 11 May will offer a performed introduction to the exhibition, including new compositions, experimental electronics and improvisations involving the sound installations themselves. Separate from the main Raise Your Voice event, Michael Jones (violin) and Anna Menzies (cello) will be joining fellow FutureEverything Showcase winners The Electronic Exchange on Friday 13 May for an exclusive project also involving members of Manchester Camerata. Themes of playful experimentation and remote working will culminate as the artists all meet for the first time to perform together a series of pieces that they have been developing in an online space. There are more details on The Electronic Exchange on the FutureEverything website and you can buy tickets here. We will be announcing details of the full programme in the coming weeks, so keep your eyes peeled.